Networks can get very complicated. You might start off with just a few devices connected to a modem and a printer and at that point, your network is easy to map. However, once you maximize the use of your hardware by implementing virtualization and you start to add on specialized servers for storage and applications, you find it is easy to lose track of all of the paths you have created for your business network. It is very common to use Cloud-based services these days and wifi links are also regularly deployed in offices alongside wired networks. So, you are going to need to get all of those hybrid networks documented. Fortunately, you don’t need to put pen to paper in order to get your network mapped and you don’t even need to set up a spreadsheet to record all of your network equipment. There are many networking tools available that can perform your network mapping for you. Many of these utilities are free and some are integrated into comprehensive network management tools. SolarWinds Network Performance Monitor (FREE TRIAL) – This tool uses SNMP procedures to discover all devices connected to a network and keep track of topology changes. 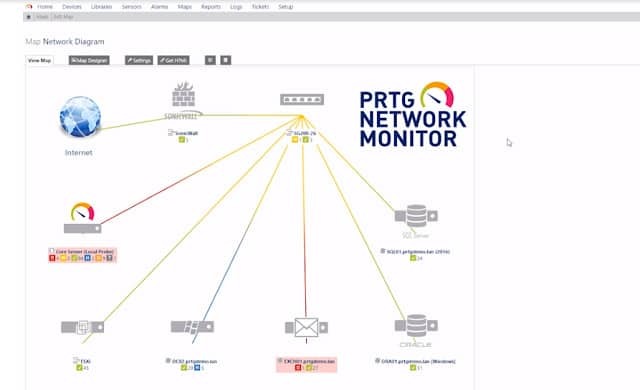 Paessler PRTG Network Monitor (FREE TRIAL) – PRTG monitors servers and applications as well as networks; it uses SNMP to map networks and track changes. ManageEngine OpManager – This tool can be installed on Linux or Windows, it has some great mapping options that feed off autodiscovery data. Nagios XI – Nagios has its own network monitoring protocol which aids in network discovery. Cacti – An SNMP-driven network monitoring system that includes an autodiscovery phase; it installs on Unix, Linux, and Windows and is free to use. Zenmap – A basic frontend to the NMap network discovery and monitoring tool. Spiceworks – An ad-supported SNMP-based network monitoring tool that includes an autodiscovery function. NetBrain – A cloud-based paid service with a 14-day free trial, this network monitor includes autodiscovery and some great mapping options. TopMaze – A free, cloud-based network monitor and mapper that runs its discovery process constantly. Intermapper – A specialist network mapping tool for Windows, Linux, and Mac OS that will create the layout of your current network after it searches via SNMP. WhatsUp Gold – A comprehensive SNMP-based network monitoring tool that installs on Windows environments and has an autodiscovery function. 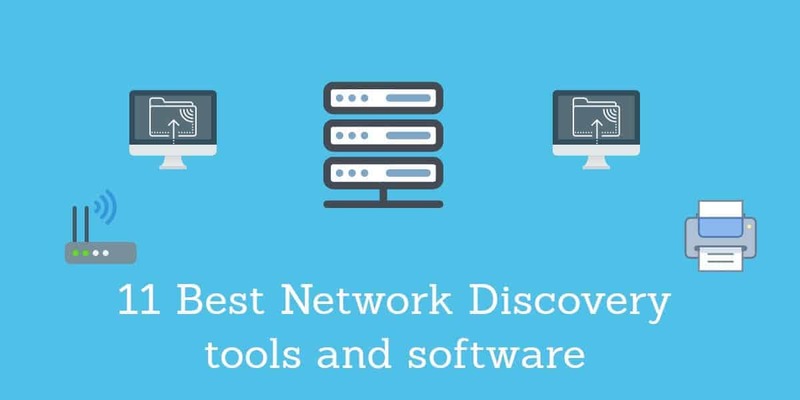 This list includes a good variety of tools so you should be able to find the network discovery software that is right for you by reading through our selection. Larger organizations that need network management functions and not just a network mapper will be drawn to the SolarWinds Network Performance Monitor. This tool begins by tracing all of the equipment that is connected to your network. The installation processes include an automated network discovery phase. The Network Performance Monitor produces a map of your network, which will make it clear how all of your equipment link together. The map includes links over the internet to remote sites and Cloud-based services, and it also includes wifi systems. The graphical displays of your network that the auto-discovery process of the Network Monitor produces include a wireless network heat map. This is a fantastic network mapping bonus because it shows where wifi signals overlap and where you have service dead zones. The information from the heat map makes it clear where you should place your wifi routers in order to get full signal coverage all across your premises. The network map itself gets updated automatically if you add, move, or remove a piece of network equipment. The map draws connections between routers, switches, and endpoints on your network. The map is color-coded displaying overloaded connections in red. It also gives a read-out of the volumes of data that each connection carries. The Network Performance Monitor includes two other mapping facilities, which also generate network visualizations automatically. These are NetPath and PerfStack. NetPath gives you views on all of the links, detailing all of the devices that data will have to pass through on a journey between two given pieces of equipment. These links even extend over the internet to include Cloud-based services. PerfStack is a really useful tool that can explain to you why applications and services are performing badly. This screen shows the ongoing performance graphs for a given application with each of the services supporting it beneath it – the services and hardware that support those underlying layers are also shown in the form of a stack. This will help you identify the root cause of performance issues immediately. The Network Performance Monitor is a comprehensive monitoring system that will keep adjusting network maps and performance indicators in real times. It will also alert you when operational metrics move into warning conditions. As a full, live management system, this package doesn’t come cheap. It installs on the Windows Server environment and you can get it on a 30-day free trial. 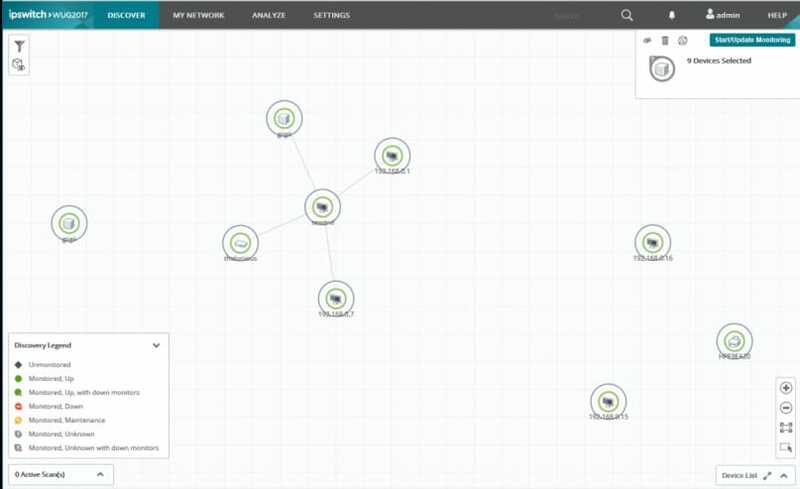 If you aren’t really in the market for a full network monitoring system and just want a tool that can map your network, then take a look at the SolarWinds Network Topology Mapper. This tool is cheaper than the Network Performance Monitor. It also runs on Windows 10 and Windows Server and you can get a 14-day free trial of it. This tool will draw you a nice, straightforward map of your network, which you can export to Visio. The Network Topology Mapper gives you a choice of detection methods and it will extend to virtual environments and off-site resources. Each node in the map is an icon that leads to a details screen that shows the type of device and its current status. You can alter the style of network map representation and update node information to add in the names that you use yourself rather than the serial numbers of the devices. You can leave the Network Topology Mapper running to get it to update the network map automatically when you change the hardware on the system. Paessler PRTG is a combined network device monitor, traffic analyzer, and server status manager. This will keep track of the health and performance of all of your network hardware and supporting devices. The server status monitoring extends to Cloud storage and online application services. Application transaction and resource utilization are also covered and the monitor extends to the tracking of database transactions that server application execution. PRTG will also cover virtual environments and wifi elements in your network. All of those different types of services take a lot of tracking and it can be very difficult to conceptualize all of the interfaces between different types of systems. Thankfully, you don’t have to set up this complicated network tracking system yourself. The software installs itself and one of the setup steps is a network discovery phase that will document and list all of these different types of devices and how they work together. You can opt for an online version of the system, but that still needs an agent to be installed on your system. The PRTG dashboard is able to assemble maps that represent all of the different elements of your network. You can access maps that show virtualization, wifi performance, VoIP traffic, general network performance by link and end-to-end, and connections over the internet through to the operations of network links and server performance owned and managed by other companies. Paessler PRTG’s monitoring system keeps gathering data on your system and reporting back live statuses on all of your equipment, including server conditions. Any problems arising in any part of the system get reported to the console immediately. Those alerts can be customized, so you can specify your own combination of errors and warnings that would make you sit up and take notice, rather than getting notified about low ink toner levels or other non-critical maintenance conditions. Those lesser problems don’t have to be discarded because you can direct different types of alerts to different team members. While all of this monitoring is going on, the network discovery process keeps you in the loop. So, any outages or performance problems get reflected on your various network maps. You don’t need to update the network inventory if you add, remove or move equipment because the monitor spots those changes and updates your network maps. The PRTG system can be accessed as a Cloud service, or it can be installed on premises – the software will run on Windows 10 and Server environments. The system is available for free to monitor small networks. However, a small system wouldn’t need all of the monitoring tools that are bundled into the PRTG tool; this option would be more useful as a partial install for assessment before getting the system to cover a large network. You can also get a 30-day free trial of PRTG. OpManager is an extensive network management system that includes an autodiscovery function. The system scans your network for devices during the installation phase and then keeps rechecking all equipment constantly. The links between each piece of equipment enable OpManager to build network maps. The maps can be displayed in a range of formats. These include a straightforward Layer 2 map that shows all equipment with straight lines representing the links between them. You can also get OpManager to display a 3D view of your premises, showing the location of each piece of equipment. If you have in-house servers held in racks, you can also get the OpManager interface to show you the position of your servers in the cabinet. Finally, you can switch to a world view that shows an actual geographical map with all of the sites of your business connected together. Although the links drawn on that map do not accurately represent the complexity of all of the internet topology between your sites, it does display performance metrics that represent the average speed of the links between your sites. OpManager continuously monitors your network equipment, using the Simple Network Management Protocol (SNMP) methodology. This system allows for device agents to report alert conditions back to the controller so you will keep abreast of the statuses of all of your network devices. This constant monitoring catches any changes in the inventory of your network and it will update the network maps automatically. 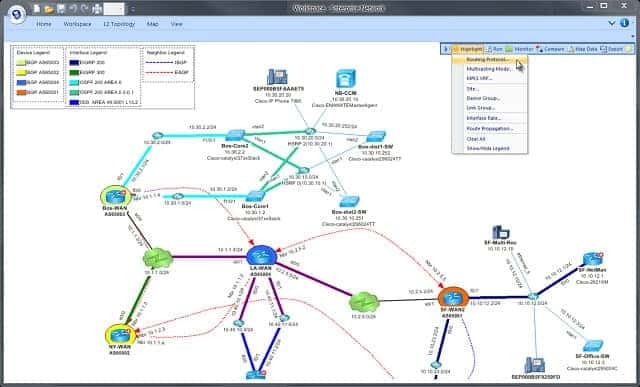 OpManager includes a network mapping tool, which enables you to create your own custom maps of your network. The network monitor locates the devices for you and then you can change the representation of the layout to be more compliant with your company’s graphical design standards. 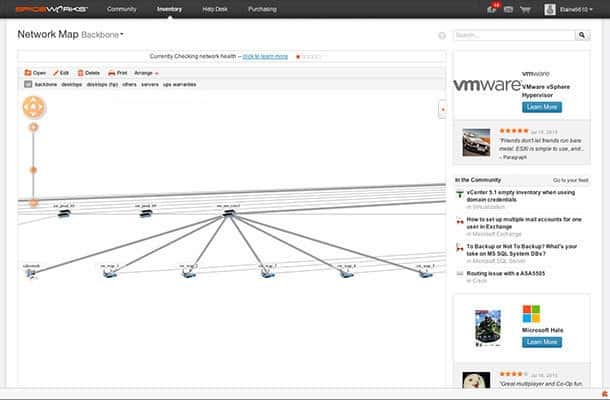 The network monitor is able to manage virtual environments and it will map those for you. It is also able to track VoIP traffic running over the data network and it can integrate wifi routers and Cloud-based servers into your network map. 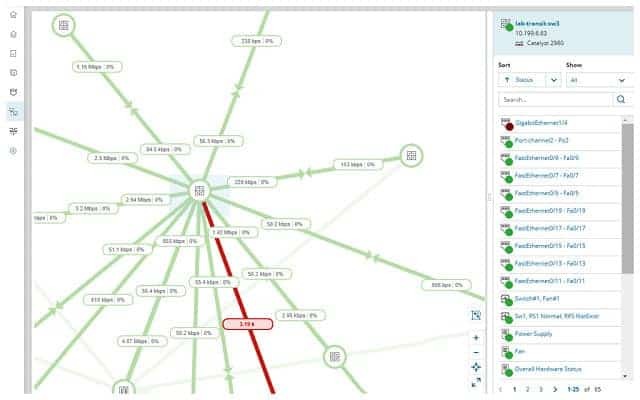 OpManager includes network traffic analysis and you can get traffic flow information both link by link and end-to-end depicted on your network maps. OpManager is available for Linux and Windows environments. There is a free version of the system, which will allow you to manage up to five devices. You can use the free version to get to know the system, using it as a free trial before you commit to buying the full system. You will encounter two types of Nagios monitoring software. These are Nagios Core and Nagios XI. The one you need to consider is Nagios XI. Nagios Core is a free, open source network management tool. However, it doesn’t have a proper front end with it. There is a Nagios Community made up of Nagios users and you can get interfaces for Nagios Core in the community forum for free from some of those users. However, Nagios XI is Nagios Core with a professional interface included, so you are better off going for that version. The Nagios XI suite includes an autodiscovery module that will map all of your network for you and compile an inventory list. The mapping feature of Nagios XI has a really useful utility, which is that it will replay all of your network’s activity, showing traffic levels on a network map. This means that you can review periods of network congestions and watch as bottlenecks appear. This is a great tool for analyzing the system weaknesses because you can examine events over and over again, making sure that you understand exactly what happened. The monitor will observe and record the status of your network equipment and you will see alerts when failure and warning conditions occur. In addition to showing alerts in the Dashboards, you can get Nagios to notify team members by email or SMS. Those alerts can be directed to different team members according to source and severity. The Dashboard can also be customized, which means that you can give access to different views and controls to different team members. The Dashboard widgets include dials, graphs, histograms, and charts that make data easier to view. Nagios XI runs on CentOS or Redhat Enterprise Linux version 6 or 7. There is a free version of Nagios XI. This is capable of monitoring small networks. Free Nagios XI is limited to monitoring just seven pieces of equipment. The paid version of the system is available in a Standard Edition and a more expensive Enterprise Edition depending on the size of your network. Like most of the tools in this list, Cacti uses the SNMP protocol to monitor network devices. A great advantage of the SNMP methodology is that it has network discovery built-in. This is because all network devices have SNMP agents installed on them, so any monitoring program just has to broadcast a report request on the network to receive notifications from all of the network equipment. This enables an initial network device inventory to be compiled. The polling process of SNMP is reissued periodically. That means that the equipment list is constantly updated. So, if you add or remove a device, those changes get registered in the inventory automatically. Cacti is a free, open-source system that was created to provide a front end to the data gathering RDDTools. So, you need to install both of these systems in order to get network discovery and monitoring. The RDDTool system is also open source and free to use. The Cacti package includes a set of graph templates. You can customize a user interface by selecting a subset of the graph template pack. You can also create multiple user accounts and assign different sets of graphs to each. The free tool is useful for allowing users to see their own service consumption in leased service scenarios, SaaS provision, storage services, and even internet service provision. The no-cost model means that a very large number of instances of the software won’t force up costs. Cacti and RDDTools can be installed on Linux, Unix, and Windows. 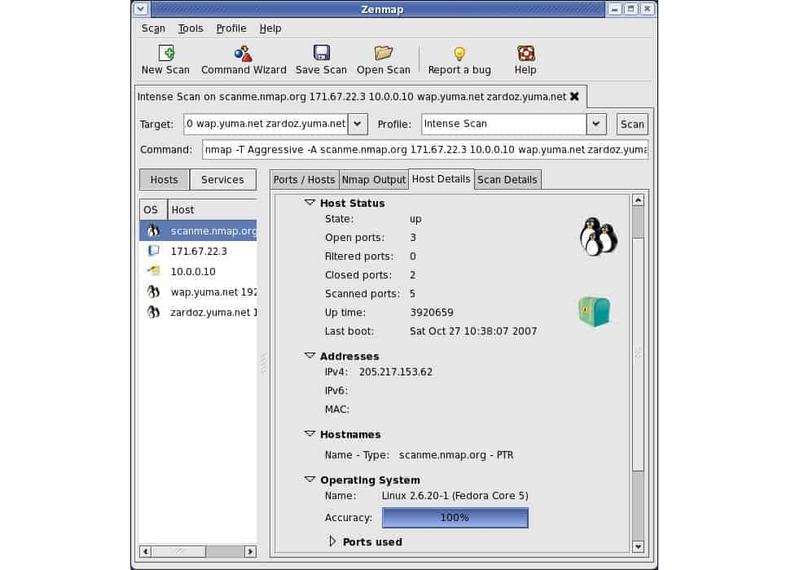 Zenmap is a graphical front end to Nmap. Both Zenmap and Nmap are free to use. Nmap is a security auditing tool, but it can be used for network scanning. Details of each node include the operating system, manufacturer, device type, IP address, hostname, and the status of the ports on the device. The interface of Zenmap is very basic and the tool doesn’t have the ongoing network monitoring capabilities of the other tools on this list. However, Nmap has a huge following and the combination of Zenmap and Nmap is widely distributed. These tools will be of use to you to provide ad-hoc system scans and security checks. As Zenmap is free, you won’t have to worry about your budget if you install it in addition to your regular network monitoring tool. Zenmap and Nmap will install on Windows, Linux, BSD Unix, and Mac OS. Spiceworks produces a suite of network monitoring tools that can be installed on premises or accessed online. All of the Spiceworks tools are free but ad-supported. In order to get all of your devices logged, you will need to use the Spiceworks Inventory module. If you prefer to install the software, you need to know that it runs on Debian and Ubuntu Linux and also on Windows and Mac OS. The Inventory tool will search your system and log all of the equipment connected to your network. Not only will it register each piece of equipment, but the facility also gives you operational details of each device. The scan will also log all of the software that you have available. The Inventory tool will keep all of your software up-to-date with the latest versions and install patches when they become available. You will also be able to see which applications are overloading the network and watch data flows that result in service bottlenecks. 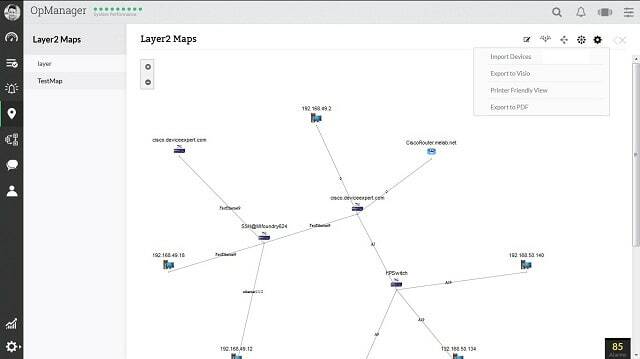 You can enhance the visibility of data and switch from list views over to a graphical representation of the network by installing the Spiceworks Network Mapper. This tool uses the information registered by Spiceworks Inventory, so you need that research tool installed before the mapper will work. You will see traffic volumes on the links between devices represented as the thickness of the line representing the link. The map covers Layer 2 (switches) and Layer 3 (routers) devices. The device icons in the map act as links to detail pages, where you can see the status and operating methods of each piece of equipment. You can generate reports out of the Inventory system that will list devices by type or you can print out graphs of usage. Server details cover disc volumes and usage, memory availability, and CPU use. Other features of the Inventory package link to the Spiceworks Help Desk module. These include the user details for each endpoint and links to your Active Directory implementation to help you manage user authorization. The Inventory system reaches out to other branches of your system to help you inform and monitor all stakeholders. NetBrain has a great network discovery procedure. The software is accessible online but it is able to penetrate your network to build an inventory of devices. You enter the IP address of a key router on your network and the NetBrain system crawls out from there to record all of your network devices. The next phase of installation is the automatic creation of a network map. The map provides the interface for other functions available with the NetBrain package. The network discovery feature of NetBrain keeps monitoring your system and updates automatically when you add or remove devices. The system will log Layer 2 and Layer 3 devices and help you manage their configurations. The Configuration Management tool in NetBrain alerts for unauthorized changes and also keeps the firmware of your network equipment up to date. The network maps are able to identify virtual environments so you can see how many VMs (Virtual Machines) are dependent on each server. You can adjust maps on the fly to request a link view or get reports on end-to-end activity on a given path. This insight helps you to identify bottlenecks and also spot ways to re-route traffic away from troubled hardware. Process automation enables you to set scripts to operate under certain trigger conditions. The automation works through a system, called “runbooks.” These are workflows that include software update tasks and data collection and analysis routines. The analysis functions help you spot intrusion and it can also assist you in right-sizing your subnets. The NetBrain system can be sampled on a 14-day free trial. TopMaze is a new network mapping tool produced by Correlsense, which has an application performance monitor as its main product. The TopMaze product is available for free and it is accessed as a Cloud-based service. This network mapping tool is suitable for small and middle-sized companies. This tool starts off by mapping your network devices. The information garnered in this discovery phase gets written into an inventory. The autodiscovery function of TopMaze isn’t a one-off process. It runs repeatedly detecting changes in the inventory and updating the system register accordingly. The TopMaze tool includes a network mapper. This produces representations of the network so that you can see at a glance to which each device is connected. This map will also update automatically in the event of changes to the resource inventory. The activity monitoring of TopMaze helps you identify intrusion. Unauthorized devices trying to connect to the network, unusual activity by one user or on one server gets you alerted to possible data theft attempts or hacker activity. The maps of TopMaze don’t only focus on hardware. The system also examines and lists all of the software that you have operating on your equipment. You can get maps that show where those applications are being accessed from and how much server power their execution is taking up. You can also choose to view network traffic flows per application. The software monitoring also extends to license usage mapping, so you can kill off abandoned processes that are hanging and blocking genuine users from accessing licensed software. This is a great tool for integrating network, server, and application performance through a map-driven visual interface. The time-saving power of graphical representations should improve your network administration productivity and help you head off problems before warning statuses build to critical failures. Intermapper is a product of HelpSystems. The tool installs on Linux, Windows, and Mac OS. This tool uses a range of technologies to detect network-connected equipment. These methods include SNMP and Ping. The tool includes an autodiscovery module, which compiles lists of hardware and also creates a map of your system. The discovery process is continuous and so any changes to the resources on the network automatically get reflected in the inventory and on network maps included in the utility. If you run a WAN, you can export Intermapper data to overlay on Google Maps to show your network on a real map of the world. Those exports can be scripted and periodic, giving you a near live map of your network status around the world. As the Intermapper system relies on SNMP, constant status monitoring is an integrated part of its processes. This monitoring also extends to the collection of alert messages sent by device agents, so you get notified immediately if there are any problems with your system. Those alerts get shown in the system console and you can also set up the alerting mechanism to get notifications sent to you or another team member by email or SMS. You can create action scripts that are triggered by alert conditions and get automatic error resolution. The data that Intermapper collects includes device statuses and network traffic flows. Alert conditions include traffic congestion as well as device statuses. The Intermapper system is available on subscription and there is a free version with monitoring and mapping functions limited to 10 devices. You can get a 30-day free trial of the full paid version. WhatsUp Gold is another network performance manager which will give you a map of your network. This system is suitable for middle-sized companies and rapidly-growing small enterprises. You don’t need to enter any details about your network equipment in order to install WhatsUp Gold because it includes an autodiscovery function. This will log all of your network devices and endpoints. The result of the autodiscovery process is a map of your network that acts as a gateway to performance details of each device on your network. The items displayed in the network map show the connections of each to other devices. The status of each device and other operating details of that piece of equipment are available on a details popup, which you can access by clicking on that node in the network map. WhatsUp Gold constantly monitors the network devices in your system for their statuses. The map will update automatically if you add or remove devices or if you move a device from one location on the network to another. The network visibility for WhatsUp Gold extends to wireless systems and Cloud-based services. The statuses of the devices are shown on the map by color coding. This shows which devices are working well, which have warning conditions and which are in alert status. Hopefully, you will keep your network in good enough shape so that you don’t receive many alerts. However, whenever an alert arises, you can get WhatsUp Gold to notify you by email. You don’t have to let all of the alerts go to one account, so if you have a large team supporting your network, you can direct alerts to different team members. The alert conditions are customizable, so you can combine conditions or set the system to ignore certain error conditions. You can also specify actions to be performed automatically when specific alert conditions arise. These actions include the running of scripts and programs, so you can get error resolution implemented automatically. WhatsUp Gold is on-premises software and you can install it on Windows Server 2008 R2, 2012, 2012 R2, and 2016. The demo version will run on Windows Pro 7, 8.1, and 10. You can extend the capabilities of WhatsUp Gold through buying add-ons for the system. The network mapper extends to virtual environments and the network device statuses may relate to network traffic volumes. However, you can deepen your visibility of virtual environments by adding on the Virtualization Monitor. Greater insight into traffic flows is provided by the Network Traffic Analysis add-on. As you can see from our list, network discovery tools come in all shapes and sizes. The autodiscovery function is a really useful setup feature of many network monitoring systems. It is also an essential element of security monitoring software, so you get a lot of choice when you are looking for a way to map your network automatically. The list that we have compiled includes tools that are suitable for small and medium networks and others that would only really be of interest to large organizations with complicated networks. The size of your network, your budget, and the operating system of your servers are likely to be the three most important selection criteria that will influence your choice of network discovery system. 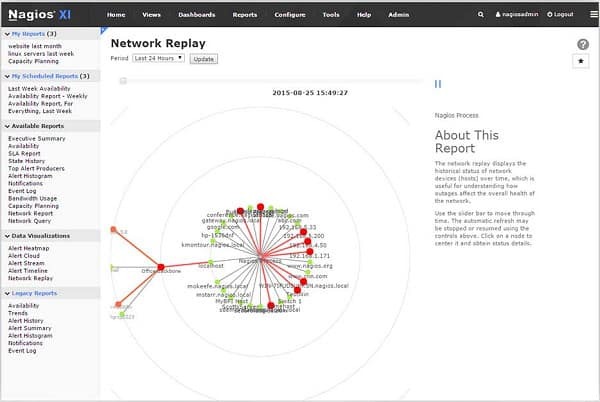 Do you employ a network discovery tool in your company? Do you use one of the tools that we have listed in this guide or do you have another tool that you could recommend? Leave a message in the Comments section below to let us know about your experiences.